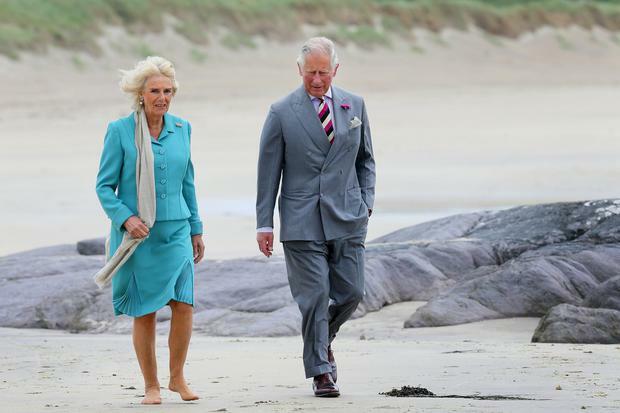 Government ministers were given strict instructions not to discuss Brexit in front of Prince Charles and the Duchess of Cornwall during their official visit to Ireland last week, the Sunday Independent can reveal. It is understood the same protocol will apply to ministers and senior government officials when Prince Harry and his new wife, Meghan Markle, arrive in the country next month. Meghan and Harry are expected to meet Taoiseach Leo Varadkar when the newlywed royal couple visit Ireland on July 13. Ahead of Prince Charles’s arrival last week, ministers were warned that it would not be appropriate to make “explicit references” to Brexit during the visit as the royal family is officially not involving itself in Britain’s exit from the EU. This included referencing Brexit in any public comments about the visit to Ireland by Charles and his wife. Ministers were also told the visit was a mix of political, civic and cultural engagements, but Brexit was strictly off the agenda. Several senior politicians, including Tanaiste Simon Coveney, Agriculture Minister Michael Creed, Minister of State Paul Kehoe and Junior Minister Kevin ‘Boxer’ Moran, met Prince Charles during his sixth official visit to Ireland. The warning to ministers came at a time of heightened tension in the UK over Brexit negotiations ahead of a crunch EU summit later this month. “Given the precarious nature of the Brexit issue in the UK, we need to be conscious not to exacerbate the problem,” one minister said. The royal family does not comment on political matters and stays neutral on affairs of state. Charles and Camilla also met with Fianna Fail leader Micheal Martin and Sinn Fein leader Mary Lou McDonald. The official purpose of Prince Charles’s visit was to build on peace and reconciliation ties between Ireland and the UK. Ministers were told the visit “reinforces the normalisation” of relations between the two countries. The highlight of the two- day trip was the prince’s visit to Derrynane House, in Kerry, the ancestral home of Daniel O’Connell. Charles and Camila also took in the English Market in Cork and visited the Cuanlee Women’s Refuge and the Irish Guide Dogs for Blind centre. Preparations for Prince Harry and Meghan’s visit are at an advanced stage but are being treated highly confidentially by government officials and diplomats. However, sources say the Taoiseach is expected to meet the couple at some stage during their short stay.